NEW YORK (June 6, 2017) – Van Wagner Sports and Entertainment (VWSE) and Liberty University Athletics today announced a long-term partnership naming VWSE as the Athletic Department’s exclusive multimedia rights partner and sales agent for the department’s corporate sponsorship program. The VWSE team, in collaboration with the Liberty athletics department, will handle management, sales and integration of corporate sponsorship on all levels within multimedia resources, including the Flames’ broadcast assets, digital, venue signage, marketing, promotional rights to athletic marks and hospitality. “As Liberty Athletics continues its expansion and upward trajectory in college athletics, we are excited to partner with Van Wagner and their highly skilled and experienced team to add value for our corporate partners, campus community and Flames Nation. I have known Mike Palisi for over 25 years and have the utmost confidence in his expertise and ability to grow Liberty’s multimedia rights,” said Liberty University Director of Athletics, Ian McCaw. A thriving athletics program has been an integral part of Liberty University's vision from the beginning, and today Liberty has 20 NCAA Division I teams, which have won more than 140 conference titles. The university regularly competes for the Sasser Cup, which is the Big South's trophy for the university which has the best sports program among the member institutions. Liberty has won the Sasser Cup 13 times, the most in conference history. This past February, the NCAA approved Liberty's football program move to the FBS level for the 2018 season. Liberty will initially participate as an FBS independent. Liberty University is an accredited evangelical liberal arts institution with 16 colleges and schools, including a law school, medical school and school of divinity. With more than 500 programs of study from the certificate to the doctoral level, Liberty equips students with both classroom theory and practical experience, effectively preparing them to enter a competitive job market. Liberty University is nestled in the foothills of the beautiful Blue Ridge Mountains in Lynchburg, Va. The university is located on the south bank of the historic James River, in a region rich in history, culture, and outdoor recreational opportunities. 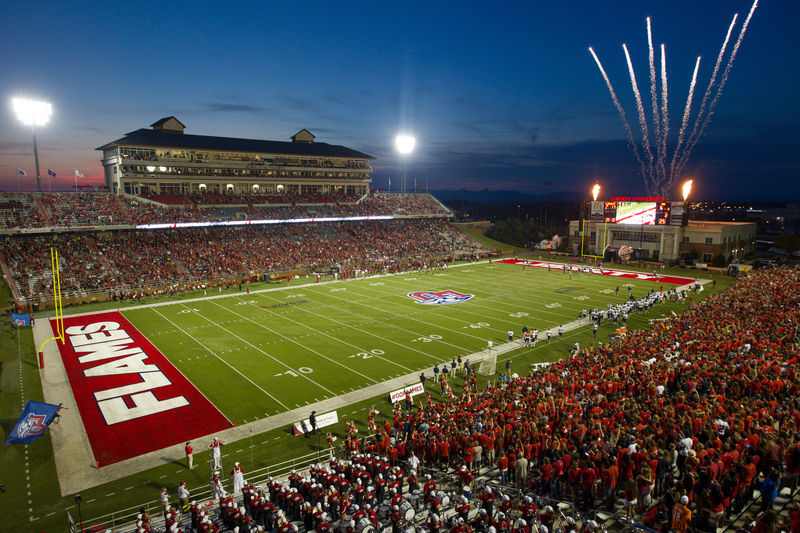 Liberty University’s athletics programs have competed at the NCAA Division I level since 1988 and have been a successful member of the Big South Conference since 1991. Liberty has claimed the Big South’s Sasser Cup trophy (awarded annually to the top athletics program in the Big South) a league-best 13 times and has captured more than 140 conference titles. Liberty’s football program, an eight-time conference champion and 2014 NCAA FCS Playoff participate, will begin a two-year reclassification process with the NCAA in 2017 and will compete as an FBS independent program in 2018. Liberty University is committed to academic excellence and to Training Champions for Christ as affirmed by our mission and doctrinal statements.